Norco and Percocet are prescription combination-medications in tablet, capsule, and liquid form to help relieve moderate to severe pain. They both contain acetaminophen, also known as paracetamol, which is a non-opiate analgesic as well was antipyretic. These drugs also have similar side effects such as constipation, dizziness, drowsiness, nausea, and addiction especially when used for a long time. Medical history particularly illnesses in relation to the kidney, liver, nervous system, respiratory system, pancreas, prostate, gall bladder, stomach, and intestines. Percocet is a North American trade name which was first approved by the US Food and Drug Administration (FDA) in 1976. This drug is currently being manufactured by Vintage Pharmaceuticals and it is a prescribed combination-medication which consists of oxycodone and acetaminophen. Oxycodone is an opiate analgesic which specifically works by altering the brain’s perception. This opioid/non-opioid pain reliever may be taken with or without food. Norco is a brand name for the prescription combination medication which consists of hydrocodone and acetaminophen. This drug is manufactured by Watson Pharmaceuticals and was approved by the FDA in 1997. It is commonly sold in tablet form and may be taken with or without food. However, patients are advised to take it with food to prevent nausea. Hydrocodone is a narcotic analgesic and is also known as dihydrocodeinone. It is a semi-synthetic opioid from codeine which is derived from opium poppies. 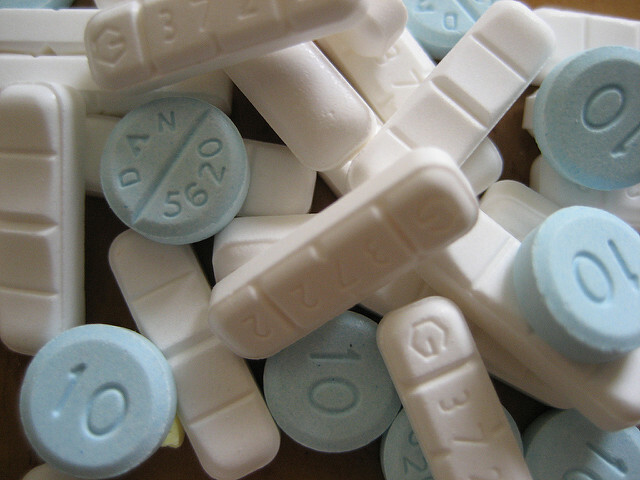 Like Oxycodone, Hydrocodone also changes the brain’s pain perception. It specifically stimulates the production of dopamine which elevates moods. Generally, Percocet is considered more potent than Norco when it comes to pain relief since Oxycodone, which is found in Percocet, is stronger than Hydrocodone which is found in Norco. Norco is usually more expensive as its lowest price is around $195 while that of Percocet is around $133. Both have acetaminophen but Percocet has Oxycodone while Norco has Hydrocodone. As compared to Norco, Percocet has a higher rate of misuse since it has a more potent opioid. Another reason may also be its more affordable price despite its higher potency. As compared to Percocet, Norco is more frequently associated with breathing problems as a side-effect as Hydrocodone (a component of Norco) in large amounts can slow down or even stop breathing. For easier classification, Percocet pills have 4 different colors (blue, pink, peach, and yellow) while Norco has three (white, yellow, and light orange). Norco pills are shaped oblong while Percocet pills may be round, oval, or oblong. 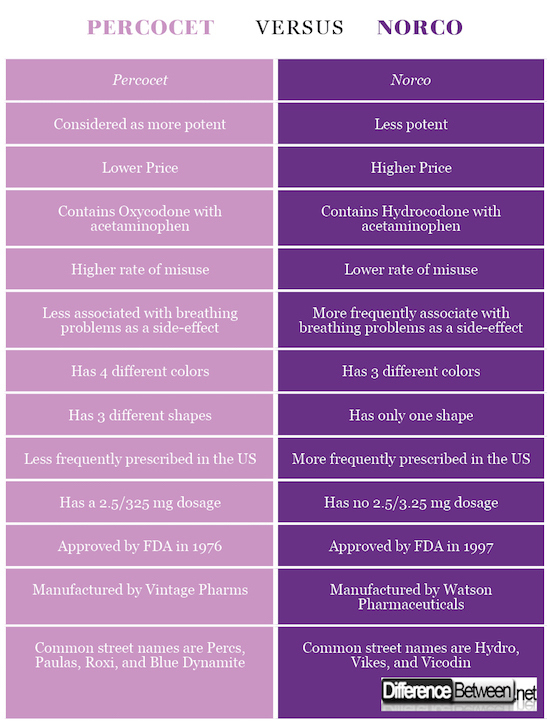 In the United States, Norco is the most prescribed pain killer; hence, it is more popular than Percocet. Unlike Norco, Percocet has a dosage with a ratio of 2.5 to 325 mg.
Norco is a newer drug as it was approved by the FDA in 1997 while Percocet was approved in 1976. Norco is being manufactured by Watson Pharmaceuticals while Percocet is being manufactured by Vintage Pharms. The common street names for Percocet are Percs, Paulas, Roxi, and Blue Dynamite while those of Norco are Hydro, Vikes, and Vicodin. Percocet and Norco are combination medications which are prescribed to help relieve pain. Both drugs contain acetaminophen, have liquid and tablet forms, and may be taken with or without food. They also have similar side-effects, precautions, and interactions. Norco is more frequently associated with breathing problems as a side-effect than Percocet. Percocet tablets come in 4 different colors while Norco come in 3. Norco tablets are oblong while Percocet tablets can be oblong, oval, or round. Percocet is less frequently prescribed than Norco in the US. Unlike Norco, Percocet has a tablet with a 2.5/325 mg dose. The FDA approved Percocet in 1976 while Norco was later approved in 1997. Vintage Pharms manufactures Percocet while Watson Pharmaceuticals manufactures Norco. gene balinggan. "Difference Between Percocet and Norco." DifferenceBetween.net. May 15, 2018 < http://www.differencebetween.net/science/health/difference-between-percocet-and-norco/ >. Anderson, James Lee. 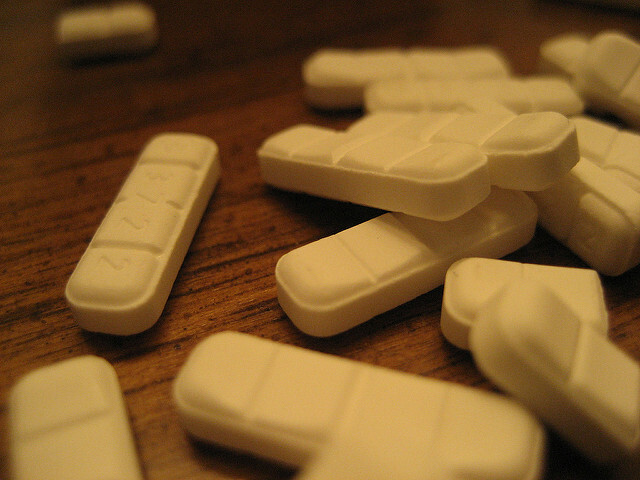 Percocet Tablet: Treats Moderate to Moderately Severe Pain. USA: Create Space Independent Publishing, 2015. Print. Kenakin, Terry. A Pharmacology Primer: Techniques for More Effective and Strategic Drug Discovery. San Diego: Academic Press, 2014. Print. Ng, Rick. Drugs: From Discovery to Approval. New Jersey: John Wiley and Sons, 2015. Print.